Bourbon or rye? Barrel or unaged? This weekend’s DC Whiskey Walk served all kinds of preferences. 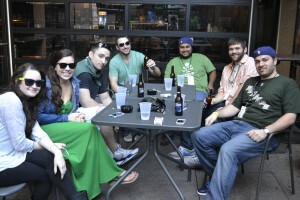 The beautifully warm weather cooperated to allow attendees to enjoy shots ranging from Jameson to Powers Gold Label, as well as beer and food specials. The event — which started early Saturday afternoon and went on into the night — took place among fun establishments usually frequented by DC’s young professional crowd, such as James Hoban’s, Mackey’s, Science Club, and Buffalo Billiards. Whether attendees wanted to sit at the bar and talk about whiskey or enjoy the warmth outside, everyone got to meet new people, celebrate the upcoming St. Patrick’s Day, and — more importantly — try all kinds of whiskeys!